Archives of Eaton Bray News for September 2005. The St Mary's Village Carnival website now has a completely new look. As part of the update, there's a new photo slide show for every Carnival since 2000 when the theme was "Around the World", up to this year's Carnival which had the theme "Nursery Rhymes". Most pages now also have a Submit Content link in the bottom right hand corner, so if you've got any pictures or memories from any of the St Mary's Church fetes, or St Mary's Village Carnivals, please use that link to send it through. Take a look around the site, and then let the Carnival Committee know what you think using the Contact Us page. The four drivers who took part in a Cannonball Run made it back to the UK late on Wednesday night - and revealed they would do it all over again. The foursome had the drive of a lifetime along with over 100 other competitors taking in London, Brussels in Belgium, Munich in Germany and Rome in Italy in five days. Rob Garofall, 33, of Weston Avenue, Leighton Buzzard and co-driver and next-door neighbour 32-year-old Mark Foster drove a Ferrari Spider F355 - while in a Porsche GT3 Mark II was 55-year-old car dealer Dave Fensome of Comp Gate, Eaton Bray, and 39-year-old design consultant Kev Jarman of Sundon Park, Luton. Speaking on his return Mr Fensome said: "It was brilliant and everybody got back safely. The best bits were meeting a load of other petrolheads and driving such a fast car - a really safe fast car - along all the roads which made up the route through Germany, Italy and back through France. "The camaraderie was great. We met some really good guys and it was nice to meet them and talk about the cars." He said that during the French leg of the 3,500 mile trip, gendarmes were out in force every two miles slowing the cars down. And in Germany the police stopped every driver, checked their papers and breath-tested them. "The German officers were very, very friendly. They just wanted to check everybody was all right on their roads," said Mr Fensome. He added the real highlight of the trip was going round the Nuremberg race circuit and nearing the finishing line in Rome. Last week we revealed that the four bought their two cars especially for the event. They also forked out more cash preparing the vehicles for the journey wiith the Porsche setting them back around £60,000 while just under £40,000 was spent on the Ferrari. The drivers were flagged off from Earl's Court in London last Friday by model Nell McAndrew. Mr Fensome added: "We did 600 miles a day which is certainly going some. But we would do it all over again if we could." 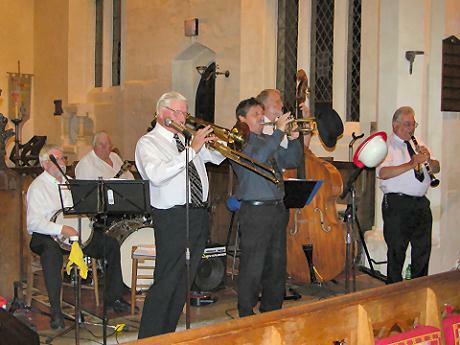 A capacity audience filled St Mary's Church, Eaton Bray, on Saturday night to enjoy an evening of traditional jazz music played by The Vine Street Six. Their lively style of foot tapping popular music of New Orleans during the 1920s and 1930s was enjoyed by all those present. The event was held to celebrate the close of a successful Church Trail Season which is sponsored by South Beds District Council to encourage more people to visit their local church heritage. Our local District Councils are sponsoring a scheme to bring films to rural communities, and Eaton Bray Hall Trustees have joined it. The first film, "Cold Mountain", will be shown at 2pm on Monday, 10th October (2005) in the Village Hall. Tickets at £3.50 are available from Mary French, or from the Hall between 2.00 and 3.00pm on Mondays 26 September and 3 October. Refreshments after the film. For more information about future films, see Eaton Bray Cinema. Keep Saturday 1st October free to enjoy the 8 mile walk in the beautiful Chilterns countryside and the friendly company. 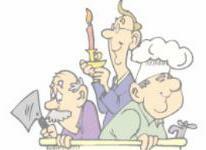 We meet at the Cholesbury Village Hall at 10.00am and there is a Pub stop half way for lunch (see Brian Wyke for the menu). There are 12 stiles on the walk and as always sturdy or sensible footware is advisable. Dogs are welcome but must be kept on a lead. Do come and join us. Further info from Brian or Barry Harris. Thank you to everyone who helped to make this a terrific evening. The good causes will benefit by around £300 each. And they're off... Four no-so-young men are set to jump into their souped-up cars and take part in a Cannonball run, just like in the film. They are determined this drive of a lifetime, which started on Friday when model Nell McAndrew flagged them off from London's Earl's Court, will be a real hoot. Driving a Ferrari Spider F355 is Rob Garofall, 33, of Weston Avenue, Leighton Buzzard, along with co-driver and next-door-neighbour 32-year-old Mark Foster. Alongside him on the grid and driving a Porsche GT3 Mark II is 55-year-old semi-retired car dealer Dave Fensome of Comp Gate, Eaton Bray, and his co-driver is 39-year-old design consultant Kav Jarman of Luton's Sundon Park. The foursome said they believed they were in for the trip of a lifetime before starting out on Friday's 3,500 mile trip. It will take them six days and the lads along with hundreds of other racers will stay in five star hotels in each of the countries they are stopping over for one night. Competitors taking part in Cannonball 8000 headed off from London to Brussels, Belgium. From there they drive to Munich, Germany then on to Italy's capital Rome before heading to Monaco on the French south coast before returning home. Mr Garofall, a director of Free Spirit Car Sales in Billington Road, Leighton Buzzard, said: "It's a once in a lifetime thing. It's a chance to do a real bit of driving and have some fun at the same time." Mr Foster added: "The aim is just enjoyment it's a once in a lifetime opportunity." They said 100 cars are expected to take part in the run, the third of its type. The men bought the cars especially for the journey and Mr Fensome said: "The motors have been specially prepared for the trip with no expense spared." The Porsche cost around £60,000 to prepare while the work to the Ferrari cost £38,000. Mr Fensome added: "It's going to cost around £1,000 per car in petrol alone. But it's going to be well worth it." The lads said they were looking forward to the nightly parties that will be held at the posh hotels they will stay in, including a black tie ball in Rome and a ball in London on their return. Mr Garofall said: "I think the best bit is going to be getting to drive these cars on the German Autobahns where there are no speed limits." The foursome plan to be back in the UK having carried out their hectic driving schedule by Wednesday. 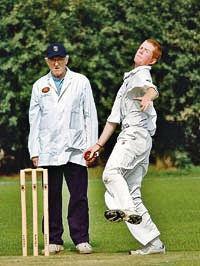 Cricket: Christians at top of table! Christians in Sport continued their winning start to the season with a 1-0 success at Eaton Bray. Nigel Mukarati's own goal was enough to give Christians the points and keep them ahead of Luton Irish and Dunstabl United who drew 0-0. Ewe & Lamb beat Hansom Cab 2-0 thanks to strikes from Kris Miller and Gareth Almey, while the 61FC Thirds and Yeoman Luton drew 1-1 with James Phillip netting for 61 and Yemi Warner for Yeoman. In Division One, AC Bellini went to the top of the table after a crushing 6-1 win over St Joseph's Reserves. Khailesh Chauhan (2), Racelito Ner (2), Joe Brett and Earl Orru scored for Bellini, while Aaron Hunter hit a consolation for Jo's. Christians in Sport Reserves thumped Vauxhall Aftersales 5-2 with Ben Henry grabbing a hat-trick and James Trapp hitting two. Crown Sundon won a seven-goal thriller 4-3 at Luton Leagrave AFC. Eloka Oji (2), Dean O'Dell and Junior George struck for Crown, Brian Fraser, Michael Komoroni and Marcus Ansell for Leagrave AFC. Delroy Browning hit Sportsman Dunstabl's lone goal in a 6-1 loss to Club Lewsey. Police are appealing for a Subaru driver, who is a possible witness to a fatal road accident, to come forward. The crash happened at 8.10pm on Friday, July 22, on the B489 Icknield Way, Eaton Bray, and involved a grey Honda Civic Type-R car, which left the road and collided with a tree. The driver, who was the only person in the car, died at the scene. Now police say that before the crash, the Honda, travelling towards Edlesborough, was following a metallic blue Subaru Impreza, which was being driven by a white man. Police emphasise that there was no conflict between the vehicles. The Subaru driver has nothing to fear by coming forward, as he is being sought only as a witness. The driver, or anyone else with information which could help, is urged to contact PC Tony Whinnett in the collision investigation unit on 01234 841212 or Crimestoppers, anonymously, on 0800 555 111. Last weekend saw the climax of another successful and exciting year of cricket in the Morrant Four Counties Cricket League, Eaton Bray pipping New Bradwell to the Division One title. The leading batsmen, Old Bradwell's Stewart Phillipson, clocked up 1,000 runs in the season and Eaton Bray's Andy Norris took his 40th wicket to finish as the season's top wicket taker and all rounder. In Division One it was Norris' efforts which ultimately helped Eaton Bray to clinch the title as they finished just five points clear of New Bradwell. Bray (144-6) beat Old Bradwell (132) by 4 wickets Michael Jarrett taking 4-25 and Norris 3-30 in Bradwell's innings before knocking off the runs with fine knocks by Nick Pearson (45) and Dom Taylor (34 not out). Norris also scored 475 runs and was the division's top all rounder. New probationer police officers are expanding on their training by shadowing patrols around Eaton Bray. The will be meeting residents to discuss any concerns they have and will build on the work of local officers who recently arrested two youths near the village on suspicion of robbery. The probationer officers are the first to operate out of Bedfordshire's new Professional Development Centre in Houghton Regis and are expected to spend time patrolling estates in the Dunstable area to get an understanding of different communities. Sgt Helena Barnard, who is in charge of the tutors, said: "This is a good example of how probationers will be getting out in the community, engaging with residents and picking up local intelligence." A vigilant member of the public alerted police on Monday after they spotted a group of teenagers with a gun. Police received the call at 4.30pm and approached the group in the recreation ground in Eaton Bray. They told police they had found part of a broken rifle although following closer inspection it was identified to be a cap gun. The youngsters handed over the gun and it is now being disposed of. Andy Norris' efforts ultimately helped Eaton Bray to clinch the Division One title of the Morrant Four Counties Cricket League, just pipping New Bradwell. Bray beat Old Bradwell by four wickets. Bradwell posted 143 all out with Michael Jarrett taking 4 for 25 and Andy Norris 3 for 30 before knocking off the runs with fine knocks by Nick Pearson (45) and Dom Taylor (34no). Norris also scored 475 runs in the season to be the division's top all-rounder. New Bradwell had to beat MK City to win the title but were held to a draw. At the foot of the table Great Brickhill beat Aston Clinton to stay in the first division. In Division Two centuries from Jamie Litherland (120no) and Glyn Davies (105) saw Winslow Town smash 262 runs for four wickets as they beat Edlesborough by 180 runs to clinch the title. In the Edlesborough innings Johnathon Waugh took 4 for 17 which brings his season's tally to 31 and confirms him as the division's leading wicket taker. Runners-up Mentmore overcame Willen by 8 wickets. Willen only managed 115 all out and Gareth Sowter scored 80 undefeated in Mentmore's reply of 119 for 2. Soulbury (203 all out) beat relegated Newport Pagnell Town (197 all out) by six runs. Danny Broad took 4 for 30 in Soulbury's innings while John Braddy's 73 wasn't enough to steer Newport home. In Division Three Cublington and Aspley Guise were promoted. Cublington overcame Stoke Goldington while Aspley Guise drew at home to Shenley Church End. Of the other four promotion contenders Caddington drew with Drayton Parslow and New Bradwell drew with Open University who were relegated along with Totternhoe. Steeple Claydon beat Great Brickhill by seven wickets to clinch the title in Division Four. In Brickhill's 110 for 9 Kevin Marsden took 6 for 18. Adam Neat top scored for Claydon in their reply of 111 for 3. Studham were second in the division. Milton Bryan clinched the Division Five title with a comprehensive victory over Wing who only managed 69 runs all out. For Milton David Shearn took 4 for 20 and Rob Wild and Clive Fuller took three each. In reply Milton Bryan lost one wicket in knocking off the runs in 12 overs. Markyate's withdrawal from the league left Winslow Town in runners up spot completing a good season for the Winslow teams. Eaton Bray (221 for 7 - Dave Roberts 72, and Lee Bearton 60) finished third in the league securing this place with an 83 run victory over Stewkley (138 all out) for whom Martin French took another three wickets to finish on 38 for the season. In Division Six Olney Town 2nds (120 for 3) overcame Milton Keynes Park (117 all out) to clinch the title. Park's defeat meant the MK City 2nds secured the other promotion place with a win over Wolverton Town 3rds. You are viewing the September 2005 archive.